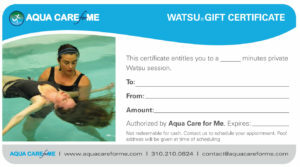 Aqua Care for Me gift certificates are a great way to give a unique & customized aquatic therapy or table massage treatment to a friend, co-worker or to someone you love. You choose the amount, type of service and time (60, 90 or 120min). All gift certificates expire within one year of the purchase date.